Many airlines have announced new routes for 2017. Some are to sunny international destinations like Cuba and Key West, while others increase travelers’ options at busy hubs. Below are the most exciting new offerings announced so far this year and a rundown of the cards to get so you can fly those routes for free. Alaska Airlines is the first carrier to offer direct flights from the West Coast to Cuba. The new Los Angeles to Havana route kicked off in early January and features Alaska’s 737-900ER. The daily outbound flight leaves in the morning, with daily return flights arriving in the evening. If you’re located outside of Los Angeles, you can grab a connecting flight at Alaska’s main hub in Seattle. The airline adjusted its scheduling to make it easier for customers to plan Cuba-bound itineraries. Alaska’s also planning to improve its service in Portland, OR in the coming months with nonstop flights to Albuquerque, Baltimore, Milwaukee and Philadelphia. Alaska Airlines Visa Signature® Credit Card is a great card for earning miles toward award flights to Cuba and other destinations. It comes with a 30,000-mile sign-up bonus and earns three miles for every dollar spent with Alaska. You’ll also get one mile per dollar on all other purchases and a free checked bag for yourself and up to six companions. Perhaps the best feature of the card is its annual companion fare. For just $121, you can take someone with you on a round-trip flight. While you can’t use it in conjunction with an award flight, it might be a good option if you’re vacationing with someone else and you don’t have quite enough miles to get to Cuba. The card has a $75 annual fee that is not waived the first year.Alaska is transfer partners with one rewards program, Starwood Preferred Guest. That means you can earn SPG points and convert them to Alaska miles at a 1:1 ratio. The Starwood Preferred Guest® Credit Card from American Express comes with a sign-up bonus of 75,000 Starpoints after spending $3,000 in the first 3 months. An additional feature of the SPG program is that you’ll get 5,000 bonus miles every time you transfer 20,000 points to an airline. And if Alaska Airlines doesn’t work out for you, you can also transfer SPG points to over 30 other airline partners. The card’s $95 annual fee is waived for the first year. Delta continues to battle Alaska in its busy Seattle hub by adding more direct flights in 2017. Service to Milwaukee begins on March 9, Nashville on May 26, Raleigh-Durham on June 8, Austin on June 12 and Kauai on December 21. If you want to take advantage of Delta’s expanding role in this key Northwest airport, start earning some Delta SkyMiles. The carrier’s co-branded credit cards are a good place to start. The standard Gold Delta SkyMiles® Credit Card has a $95 annual fee that’s waived for the first year. It comes with a 60,000-mile sign-up bonus and a $50 statement credit toward a Delta purchase. 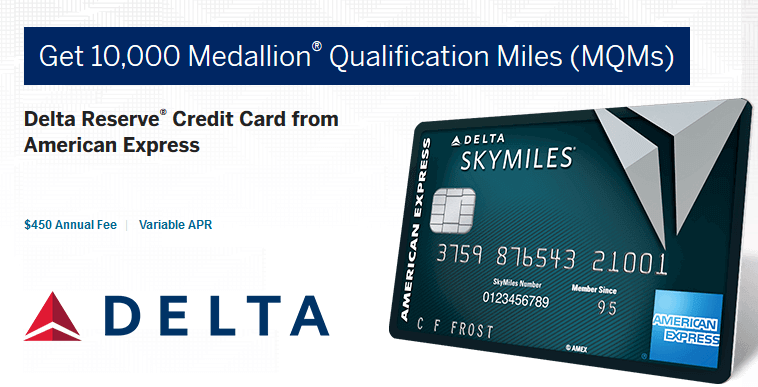 The Platinum Delta SkyMiles® Credit Card card has a $195 annual fee that is not waived, but it does have a slightly bigger sign-up bonus at 70,000 miles and twice the statement credit. You’ll also earn 5,000 elite qualification miles (MQMs) at sign up, plus an additional 10,000 miles and MQMs every year that you spend at least $25,000. Perhaps the most lucrative perk, though, is the annual domestic main cabin round-trip companion ticket that comes free with the card. The Delta Reserve Credit Card is the premium offering in the lineup. While it comes with some nice perks, like free lounge access and an annual first class companion ticket, it’s hard to justify its hefty $450 price tag. Its sign-up bonus is a meager 10,000 miles, though it also comes with 10,000 MQMs and the possibility to earn another 15,000 miles and MQMs if you can make $30,000 in purchases in a year. All three cards include a free checked bag.Delta is part of the American Express Membership Rewards program, so you can transfer points earned with Amex cards to the airline. Sixteen other airlines belong to the program, too. American Express offers a wide variety of cards with different benefits and price points. Two of the most popular cards among frequent travelers are the American Express® Premier Rewards Gold Card and the Amex EveryDay® Preferred Credit Card. The American Express® Premier Rewards Gold Card has a $195 annual fee that’s waived for the first year and a 25,000 point sign-up bonus. The best benefit of this card is its excellent bonus earning categories. You’ll get triple points for airfare and double points at restaurants, gas stations and grocery stores. The Amex EveryDay® Preferred Credit Card has a $95 annual fee that is not waived. It comes with a 15,000-point sign-up bonus, but it offers excellent bonus earning potential. You’ll get triple points for groceries and double points for gas. United launched a new seasonal route from Chicago to Key West early in January. The service will run until April 29. This once weekly flight departs and returns on Saturdays on United’s Ebraer EMB-170 aircraft. United also started offering daily flights from Newark to Key West. If you’re looking for an award ticket to this sunny destination, getting a co-branded United credit card is a quick way to earn some miles. The United MileagePlus Explorer card is the most affordable option with a $95 annual fee that’s waived for the first year. It currently comes with a 50,000-mile sign-up bonus, plus an additional 10,000 miles every year you spend at least $25,000. The card includes a free checked bag for you and one companion. United is a transfer partner with the Chase Ultimate Rewards program, too. You can earn points with either the Chase Sapphire Preferred or Sapphire Reserve card and convert them into United miles. Both cards currently come with a 50,000-point bonus after spending $4,000 in the first three months. The Chase Sapphire Preferred® Card is the cheapest with a $95 annual fee that’s waived for the first year. You’ll earn double points for travel purchases and dining and one point per dollar for everything else.The Chase Sapphire Reserve®, on the other hand, has a $450 annual fee. It’s important to note, though, that it also comes with a $300 annual travel credit that can be used for a wide variety of travel-related purchases, such as hotels and airfare. That goes a long way to covering the card’s cost. You’ll also earn more points on purchases since the card offers triple points on travel and dining. The other notable perk that comes with this card is complimentary lounge access for you and one guest thanks to a free Priority Pass Select membership. There are other benefits too, such as the Global Entry/TSA PreCheck fee credit and discounts on Chase UR travel portal purchases. The Ultimate Rewards program is transfer partners with six other airlines, too. Everyone’s favorite budget domestic airline, Southwest, is adding two more international routes to its repertoire. After the expansion, the carrier will serve a total of 15 international destinations located in the Caribbean and Mexico. It’s worth noting that in addition to its affordable fares, friendly service and positive corporate culture, Southwest is the only U.S. airline that still offers free checked bags on domestic flights. Southwest has two co-branded credit cards, the Rapid Rewards Plus and the Rapid Rewards Premier. The Plus has a $69 annual fee, and the Premier has a $99 fee. Both come with a 50,000-point sign-up bonus and earn double points on Southwest purchases. The biggest difference between the two cards is that you get a 3,000-point anniversary bonus with the Plus and a 6,000-point bonus with the Premier. Like United, Southwest is also a part of the Chase Ultimate Rewards program, so you can transfer UR points to your Southwest Rapid Rewards account. Both of the Chase Sapphire cards mentioned earlier in this post are great options for earning UR points. There are a lot of ways to earn points or miles. You could take part in a car rental promotion, make purchases from an airline’s online shopping portal, book vacation packages or cruises through your favorite carrier or simply fly. But getting a big sign-up bonus and earning points from everyday purchases is still be the quickest and best way to boost your points or miles balance quickly. Whither it’s a co-branded airline card or a rewards card with transferable points, finding a credit card that works for you is the key to a winning strategy.